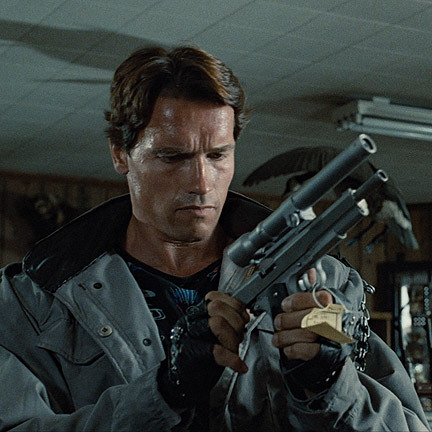 This gun was utilized by by Arnold Schwarzenegger in the 1984 motion picture “The Terminator”. 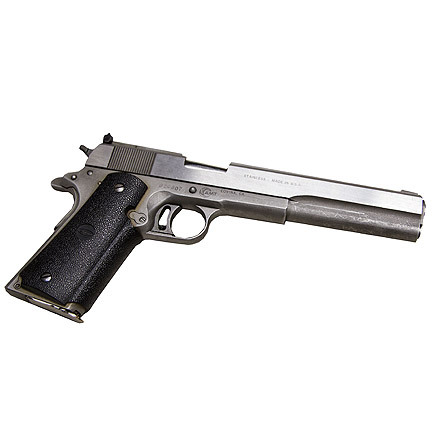 The AMT Hardballer .45 Longslide featured a laserlock sight which was a one off made for the production by a company now named Surefire. The sight was removed for use in a subsequent production and is not included. 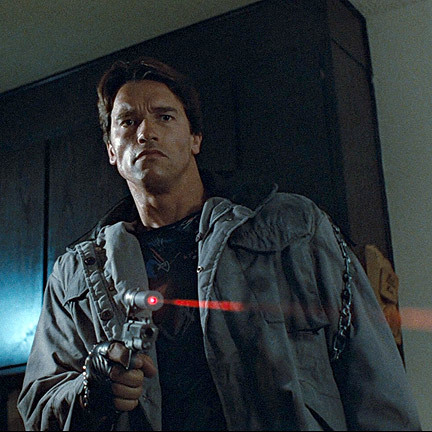 The Terminator first uses the .45 to kill two women who share the name Sarah Connor, and when he arrives at Sarah Connor’s (Linda Hamilton) apartment and confronts her roommate, Ginger Ventura (Bess Motta). 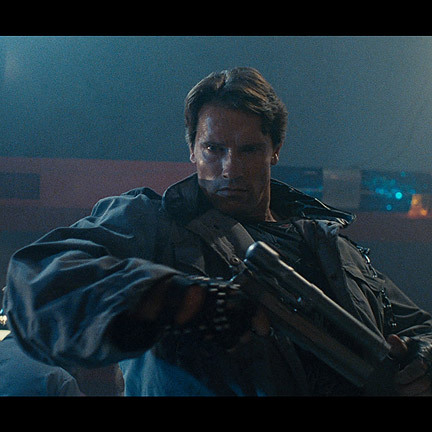 Mr. Schwarzenegger can also be seen utilizing this prop when he first Sarah Conner (Linda Hamilton) to a Los Angeles club. His attempt to assassinate her is foiled by Kyle Reese (Michael Biehm), who has been sent to the past in order to defend her life. 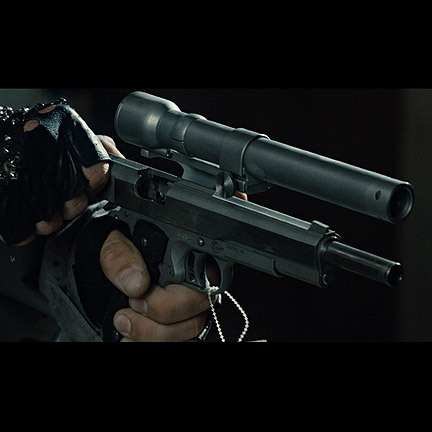 The gun is also featured on the movie poster and promotion images for the film. This item is in excellent screen used condition and comes with a signed letter of authenticity from the prop house. THE WEAPON CANNOT FIRE LIVE AMMUNITION AND HAS BEEN MODIFIED TO FIRE BLANK ROUNDS. LEGAL COMPLIANCE WITH LOCAL LAWS AND SHIPPING TO A LICENSED FFL DEALER MAY BE REQUIRED TO BROKER PURCHASES IN SOME STATES. 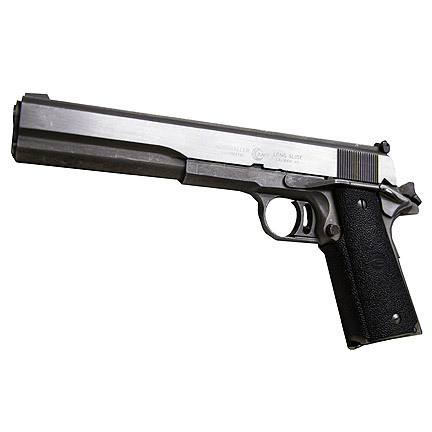 BUYERS SHOULD CONTACT THEIR LOCAL FFL DEALER PRIOR TO PURCHASING TO BE ADVISED OF ALL APPLICABLE LEGAL REQUIREMENTS.